XpertHR Salary surveys enable you to benchmark the pay and benefits of your employees against market data to help you make informed decisions about reward strategy. set up new pay and benefits structures. This user-friendly online tool provides you with unlimited access to search our salaries database, refining roles by seniority, function, location and other criteria. You can see your organisation's data against the market rates to help benchmark salaries, and create charts and tables to download in Excel for use in reports or presentations. Our reports include the most commonly requested salary tables with basic pay and bonus rates broken down by seniority, function, location and other criteria. We also report on pay trends and employee benefits such as car allowances and pension contributions. You can sample a survey and try the Job Pricing tool. 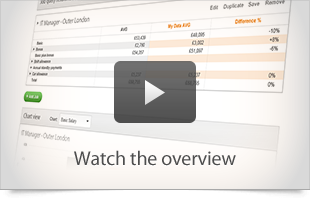 Our Excel-based table viewer enables you to find the salary table you want quickly and easily. Tables show median, average and quartile rates broken down by job level, job function and other criteria. This Excel spreadsheet is unique to your organisation including data from all salary tables in the report set against relevant figures for similar jobs drawn from your own data. This tool will highlight where your organisation's salaries may differ from the market by a significant variable. This Excel spreadsheet is unique to your organisation. Use it to select a single employee from your organisation, identified using the unique code chosen by you, and see how that employee's pay compares against market rates by seniority, location and other factors.